This picture really states it all, folks. I’ve said it before and I’ll say it again, when you write for glory, you receive emptiness, whereas when you write for joy, you receive satisfaction. 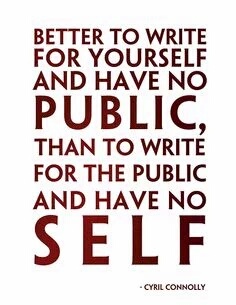 There’s a big difference between writing for the public and writing for the self. For years, I wrote stories because it was exciting, fun, and very satisfying to finish these adventures and have accomplished what so many only daydream about. Sure, I let my friends read them, but I never contemplated publishing them because I didn’t believe I could do it. Then my friend and mentor sat me down with probably the best pep talk I have ever and will ever receive. She said “You can’t fail for trying, but if you don’t even try, then you’ve already failed.” And she was right. All those years telling myself I couldn’t do it – wasn’t worth investing in – I was just proving failure. Flash forward to the present, I am now the proud author of three novels, all of which I have published, presented, and designed myself. I’m a small town girl, yet hundreds of people have read my books. After years of hard work and research, I can say I am an author. I am a writer. But I discovered something along this road. Before I loved writing. I loved spending hours scribbling on paper. Now I have deadlines and speaking events, a blog, and book fairs to attend. I write less. I dream less. And the idea of sitting down with pen and paper does not excite me anymore. This is my present. The solution? Stop writing for the public. It’s true. I have one more book set to be published in 2017, but after that, I’m stepping back from the public. Sure, I love meeting new fans or hearing how my books impacted them, but glory is fleeting and leaves you feeling cold and empty when you chase after it. I miss writing. I miss dreaming. And hasn’t that been my motto to the masses? So who are you writing for and why? If you can honestly answer those questions, it will give you a lot of insight and maybe even clear a path for you. Here’s another story for you. My friend who’s a brilliant storyteller finally discovered his gift for writing. He shared his work with a small circle of friends, and we raved over it. It was wondrous! We loved the story, we loved the characters, and we were so excited to read more. He rushed to publish the first book in a series he planned to write. We all bought his book. But then life took over. The fans dwindled. We didn’t have time to read everything he wrote. He stopped writing. He stopped. Why? He had a gift. He had amazing talent and a brilliant story. His fans would have still followed him had he continued writing and publishing this series he dreamed up. But he chose instead to quit. Can you tell who he was writing for? Why do you think he quit when the glory faded? I hope he picks up the pen again. I sincerely do.